Having fallen in love with basket making, I’ve recently developed 3 new unique willow Sculpture Days that combine my love of basketry techniques with a sculptural twist. 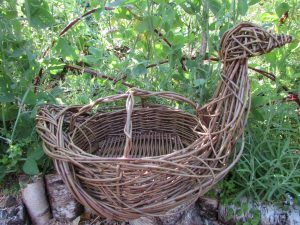 Those of you who’ve attended my Willow Animal Sculpture Days over the past 4 years know that I strongly believe one of the ways to get more of us interested in basket making and this amazing craft form is to ignite our passion for playing with willow. My aim during these Sculpture Days has always been to inspire, enthuse, and teach willow sculpting methods. I’m really pleased that so many of my participants got the ‘willow bug’ and have gone on to become commissioned willow animal artists, teachers and (even more excitedly!) 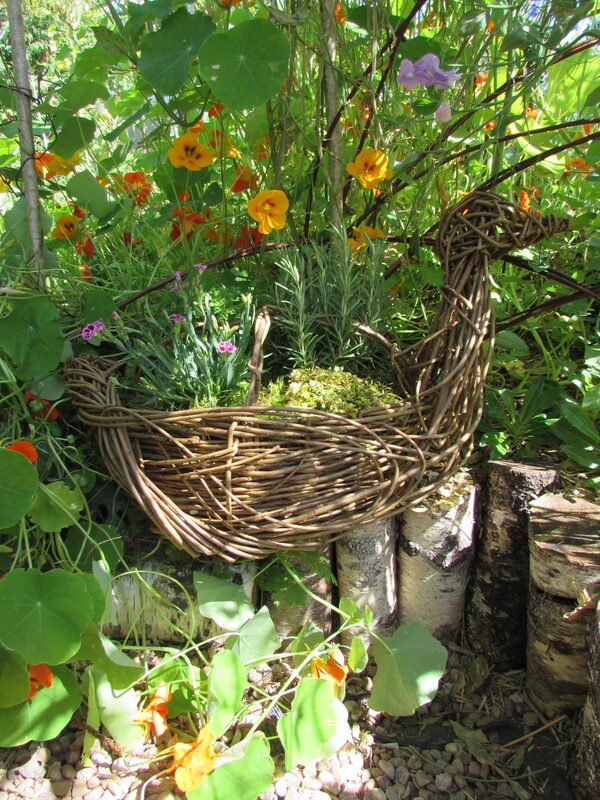 are now attending basket making courses right across the UK. But what about myself? I’m aiming to become the best basket making teacher that I can possibly be. I’ll be doing this through years, (a life time!) of my learning the knowledge and techniques from amazing crafts men and women. I want to learn as much as I can about tradition English basket making techniques. I want to create and take traditional baskets into the future by giving them new functions and/or sculptural twists. 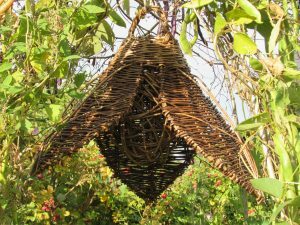 To this end, I’ve developed 3 new Willow Basketry Sculpture Days that are a fusion between my own current basket making and learning, along with my existing love of willow sculpture. 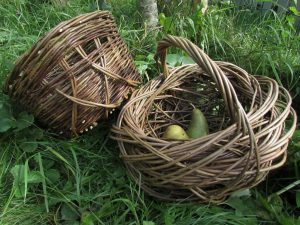 I’m not claiming to be an amazing basket maker, but I do know that these new workshops are a natural progression for me to teach basket making techniques with my own unique style and enthusiasm. 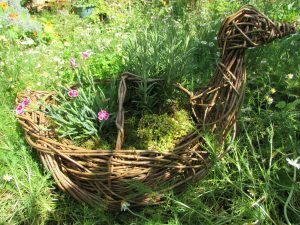 Having developed the Herb Bird Basket fusing a frame platter with stake and strand techniques, it was obvious to me to develop a Sculptural Baskets workshop with techniques that could be taught to absolute beginners. 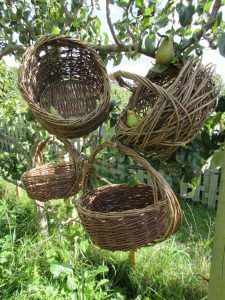 As I’ve been learning how to make baskets I’ve often felt that ‘one dodgy move and the basket would be ruined’. Although this isn’t necessarily the case, (and actually the discipline, repetition and honing of techniques is necessary to becoming a decent basket maker), I realised that I wanted to take the pressure out of early basket making and our imagined need for perfection every time. The resulting Sculptural Baskets that I teach are an exploration into making baskets, one in which we can adapt and play with form, elements and techniques. At this particular Sculpture Day participants can choose between creating a basket using my newly developed method or making a lovely large sculptural basket using free weaving techniques. It seemed really natural to combine both my love of flowers, and the amazing advances in outdoor LED lighting in the past few years to create a show stopping willow Flower Lantern Sculpture Day. I’ve always loved crafting flower forms, whether in willow or years ago by scale up Irish Crochet in wire. 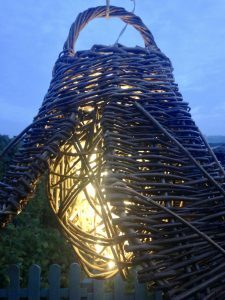 I’ve developed the Willow Flower Lantern to combine simple basketry techniques such as pairing and free weaving with making a lovely twisted handle. I want participants to be able to make their own unique centre piece for the garden that can’t be bought in the shops! ← Finally… my dream workshop!